The Byzantine emperor was the head of the Catholic Church i.e. the universal church as identified in the Nicene Creed during the 325 Council of Nicaea. He appointed the bishops, including those highest in rank, such as the Patriarchs of Rome, Alexandria, Antioch and Constantinople. For this reason many churches in Constantinople were built at the initiative of the emperors. A large apse and two high walls is all that remains of Studion, one of the greatest Byzantine institutions. It was a very large monastery which was founded in 462 by Studius, a Roman patrician. In the course of time it became the University of Constantinople although it was mainly limited to theological matters. The life of the monks had to comply with strict rules, including that which forbade women from entering the premises of Studion. These rules were adopted in many other Orthodox monasteries and are still complied with in the monastic Republic of Mount Athos in Greece. 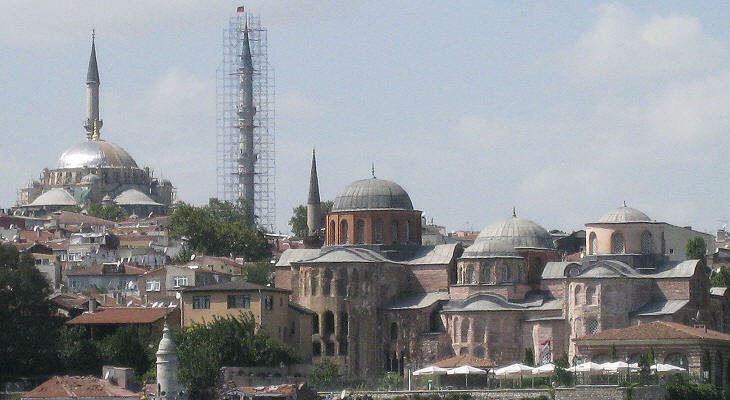 The Studion was damaged during the 1204 Latin conquest of Constantinople and again in 1453 during the Ottoman one. 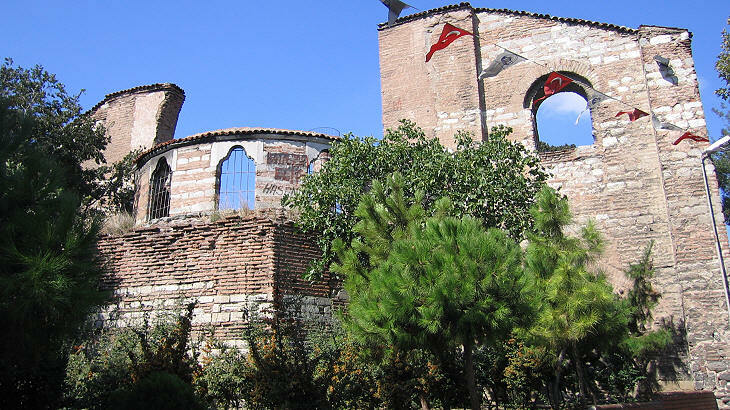 In 1462 Sultan Fatih Mehmet evicted the remaining monks and he turned the church into a mosque. Two fires, an earthquake, a long abandonment and looting have destroyed the whole monastery and to a great extent the church; its remaining walls show that they were built according to the traditional Byzantine construction technique based on alternate layers of brick and stone. It is situated on the Seventh Hill near Yedikule, a small Ottoman fortress. Polyeuktos was a Roman army officer who was beheaded in the IIIrd century because of his Christian faith; the events surrounding his martyrdom provided the basis for a drama by Pierre Corneille and later on for operas by Charles Gounod and Gaetano Donizetti. 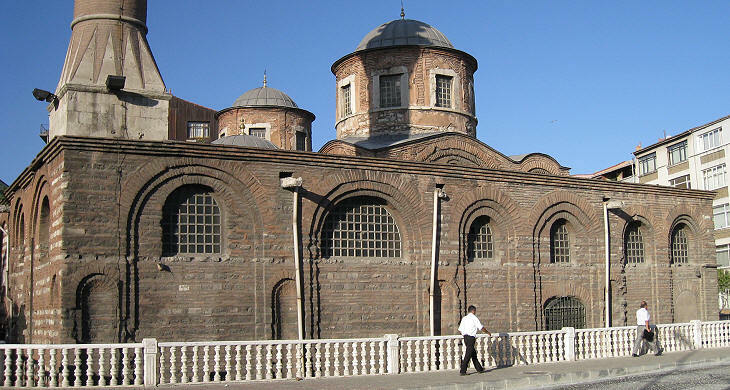 In 524-527 Princess Anicia Juliana enlarged and embellished an existing church dedicated to St. Polyeuktos. She was the daughter of Anicius Olibrius, one of the last western Roman emperors and a relative of the Theodosian emperors who ruled the Eastern Roman Empire for a long period. The church was most likely already abandoned in 1204 when Constantinople was sacked by the Crusaders; the Venetians took from this church a porphyry relief thought to portray the Tetrarchs. The remains of this church, which was pretty large, were found during the construction of an overpass. 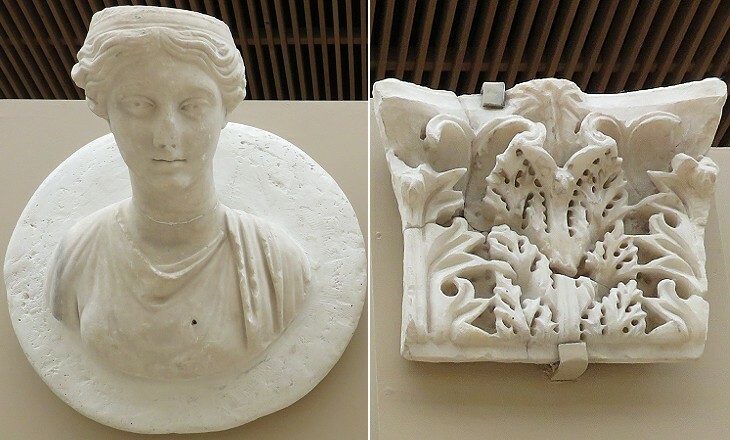 A fine relief celebrating Anicia Juliana can be seen at the Archaeological Museum of Istanbul. 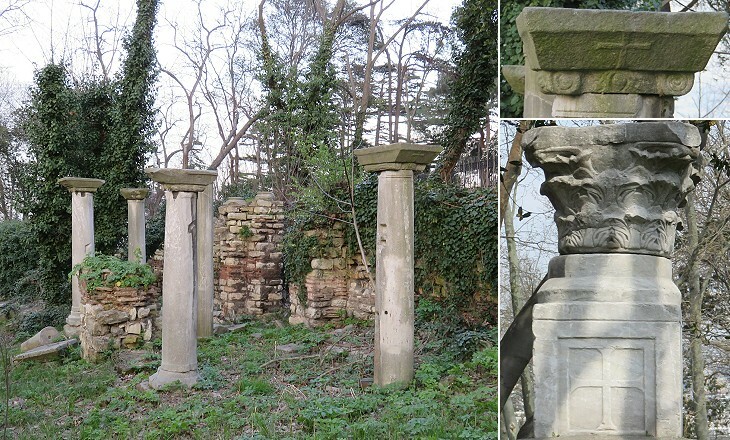 Gulhane Park was the outer garden of Topkapi Sarayi before being opened to the public. The remains of Byzantine buildings have been found at its northern end near the Column of the Goths. They are believed to belong to the Orphanage of St. Paul. The institution was founded by Emperor Justin II (565-578) and served not only orphans, but also elderly people, the blind, and war veterans. After the death of Emperor Justinian several events weakened the Byzantine Empire; in Italy the Longobards conquered most of the peninsula, in Asia a very long war with the Persians paved the way for the Arab invasion of Syria, Palestine, Egypt and parts of Anatolia. In 672 the Arabs managed to lay siege to Constantinople (it lasted several years). 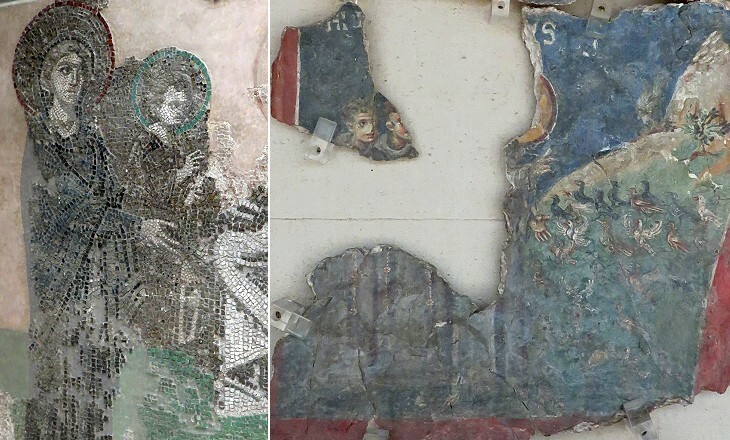 During the VIIIth century the issue of iconoclasm tore apart the unity of the remaining part of the empire; this may explain why Istanbul does not retain evidence of churches or other monuments built during those difficult years. The conditions of the empire improved under the reign of Emperor Basil I (867-86): according to some art historians, but not to all of them, Gul Camii was built during the reign of this emperor. It was a church dedicated to St. Theodosia, a martyr of the VIIIth century who was killed for having tried to save a sacred image. 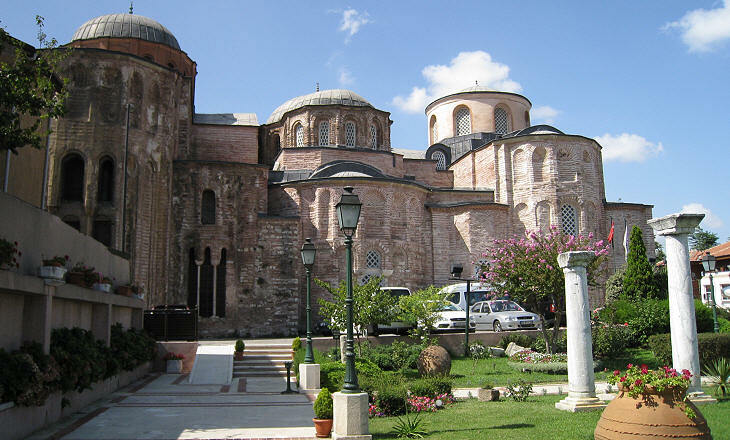 The church was turned into a mosque: its name is generally attributed to the fact that when the Ottomans conquered Constantinople, they found the church full of garlands of roses, which had been placed there for the saint's feast. 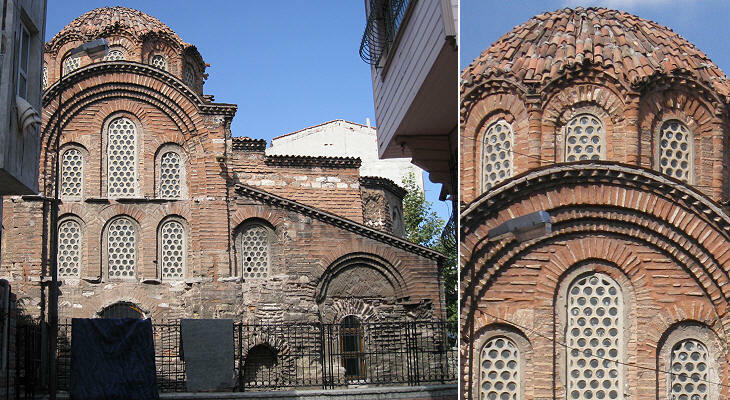 The present building shows several modifications made after it became a mosque, but the brickwork of its three apses is very typical of Byzantine architecture. Another small church a short distance from St. Theodosia's shows a similar design; its original dedication has not been identified: it was turned into a mosque by Koca Mustafa Pacha, a grand vizier of Sultan Beyazit II; because another mosque is named after him, in this one he is called Atik (ancient) instead of Koca (illustrious, but also old). Constantine Lips are not the lips of Constantine, but the name of the officer responsible for the security of the imperial house during the reign of Emperor Leo VI (886-912). In 908 he founded a nunnery with attached a small hospital and a church. A second church was added towards the end of the XIIIth century south of the existing one. 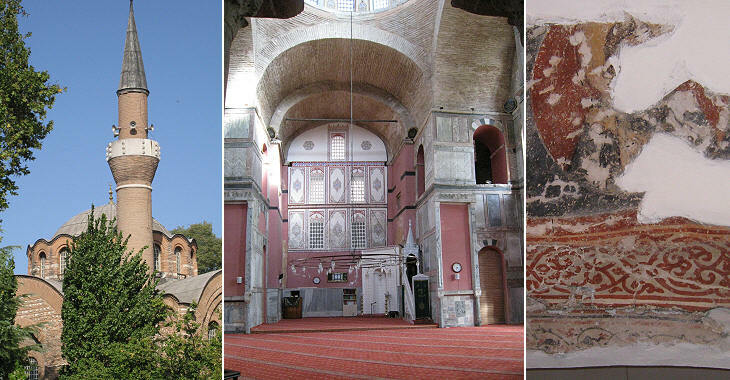 The Ottomans turned this church into a mosque and the nunnery into a dervish lodge. The complex was burnt down by three fires and was abandoned. It was restored in the 1980s. The apses were spared by the fire and show continuity in the overall design; a more elaborate decoration was used for the XIIIth century apse with bricks arranged to form a variety of decorative patterns. Laleli is a neighbourhood of Istanbul with many shops selling clothing and leather goods; it is beloved by Russian tourists and it is full of Turkish vendors trying to speak Russian. In this very marketing oriented environment big apartment blocks surround a church which is a very interesting example of Byzantine architecture. It was built in ca. 922 by Emperor Romanos I Lekapenos (919-44) as a family chapel. He was a co-emperor: he had persuaded his young son-in-law Emperor Constantine VII Porphyrogenitus (912-59) to appoint him to such position and then also his two sons were appointed co-emperors. Sharing the same roof is often difficult and probably Constantine VII continued to behave in the imperial palace as if he were the only legitimate landlord. Romanos decided to build a separate palace for his family; he covered with a ceiling supported by columns an abandoned ancient rotunda; above it he built a palace, a monastery and the church, the only part of the complex which survived fires, earthquakes and pillaging. The church marks a move away from the basilica-like design of the VIth century churches and it is characterized by the introduction of a cross-in-square plan and by many curved lines. It is regarded as the prototype for most of the Orthodox churches. The definition "cross-in-square" means that a Greek cross is inscribed in a square building; the overall shape of the building is rectangular owing to the additions of a narthex on one side and of three small apses on the other. Romanos thought he had ensured the future of his family (he had also appointed a third son Patriarch of Constantinople), but when he became very old his two co-emperor sons tried to exclude Constantine VII from the succession; the people of Constantinople revolted and all the Lekapenos ended their days in a monastery. 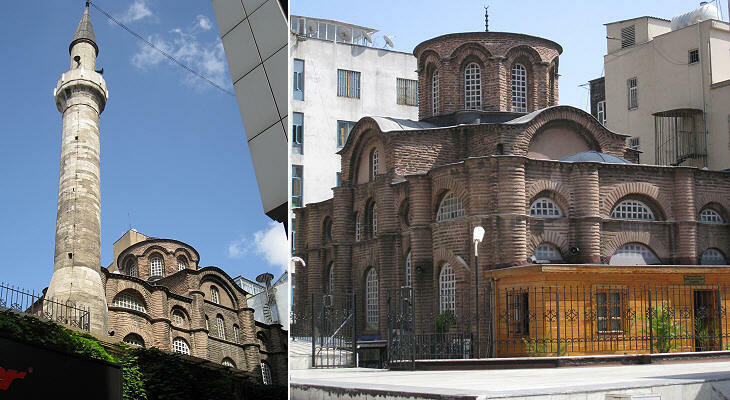 The cross-in-square design was adopted also in this church which was attached to a nunnery built by Anna Dalassena, mother of Emperor Alexius I Comnenos (1081-1118), to whom she was the closest advisor; her son gave her the title of Augusta which was reserved to the emperors' wives. much is said in praise of her. She never uttered those cold words 'mine' or 'yours'. The church is almost entirely surrounded by modern buildings. 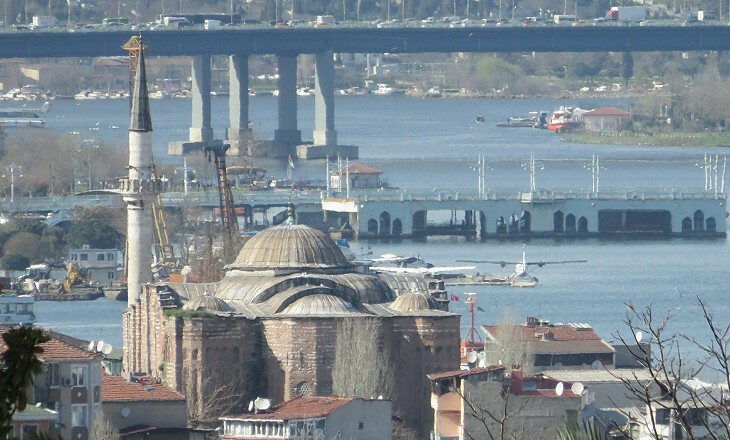 It was turned into a mosque by the Ottomans and the nunnery was used as an imaret (soup kitchen) for those who worked at the construction of nearby Fatih Sultan Mehmet Camii, the mosque built by Sultan Mehmet II, the conqueror (fatih) of Constantinople. For this reason it was called the mosque of the old (eski) soup kitchen. It was restored in 1970 and the dome was covered again with bricks (all the other domes of Istanbul are covered with lead). 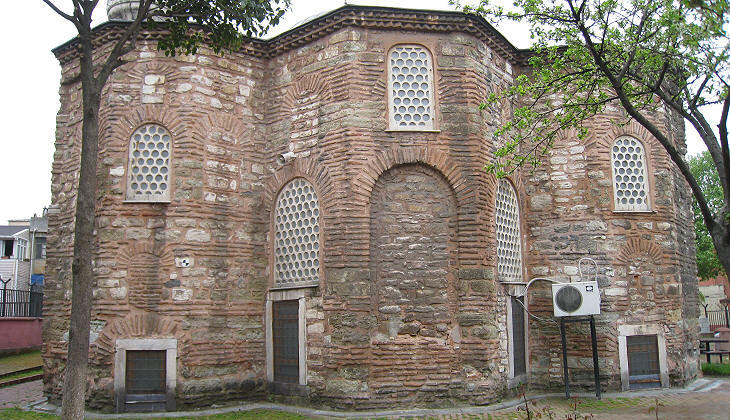 As usual in Byzantine buildings, the masonry is very elaborate; in particular the use of recessed bricks to add depth to curved lines. 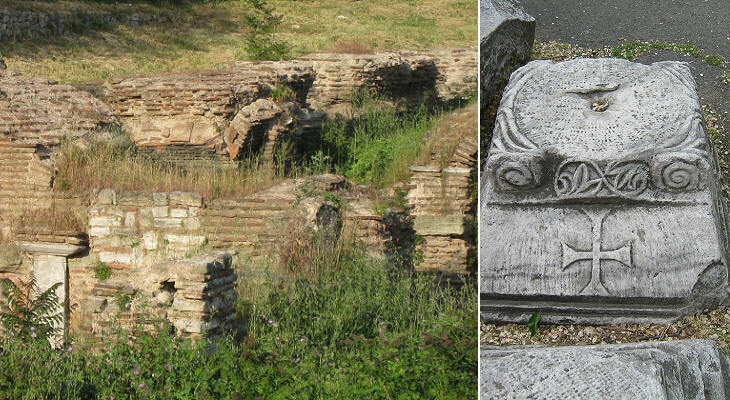 A second nunnery was built by Empress Eirene (born Princess Piroska of Hungary), a few years later in the same neighbourhood. She was the wife of Emperor John II Comnenus (1118-43), grandson of Anna Dalassena. After her death her husband added a slightly smaller church to the first one and linked the two with a chapel. The complex became the mausoleum of the imperial couple. 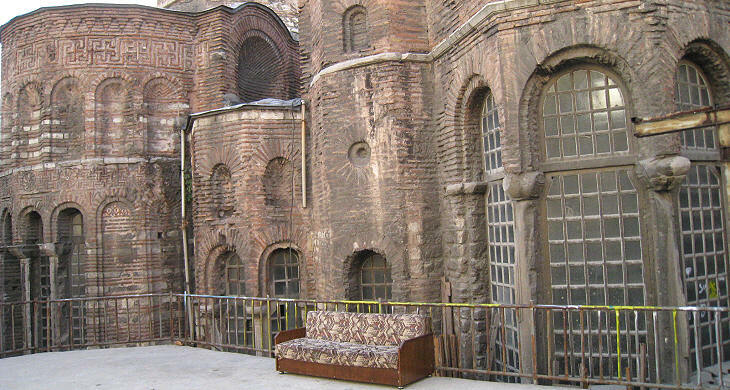 The complex, which in its totality is the second largest Byzantine building after Hagia Sophia, was turned into a mosque, but later on it was abandoned. It is now (September 2008) in the process of being slowly restored. The apses are the finest part of the building; that of the larger church has seven sides. At the eastern end of the Aqueduct of Valens the foundations of a bath were used to build a church; in the course of time modifications and additions were made until towards the end of the XIIth century the current building replaced the old ones. After the Latin conquest of Constantinople in 1204 the church and the attached monastery were given to the Franciscans: this was discovered during restorations in the 1980s when a cycle of frescoes portraying the life of the saint was found in a small chapel; they were painted some time after Francis' death (1226) and before the fall of the Latin Empire (1261). During the Ottoman rule the church and the monastery were used to accommodate the kalender, wandering dervishes, followers of the teachings of Mevlana Jalal-ad-Din.